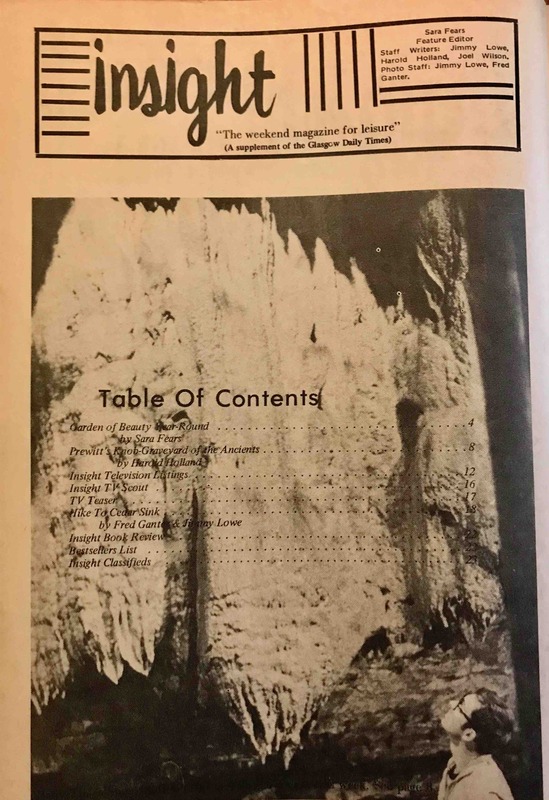 1970 "Insight" feature on Crystal Onyx Cave and Cleon Turner. Old bones, tortuous tunnels, scintillating stalactites and stalagmites, and above all, the mystery of what may lie just a little further on! 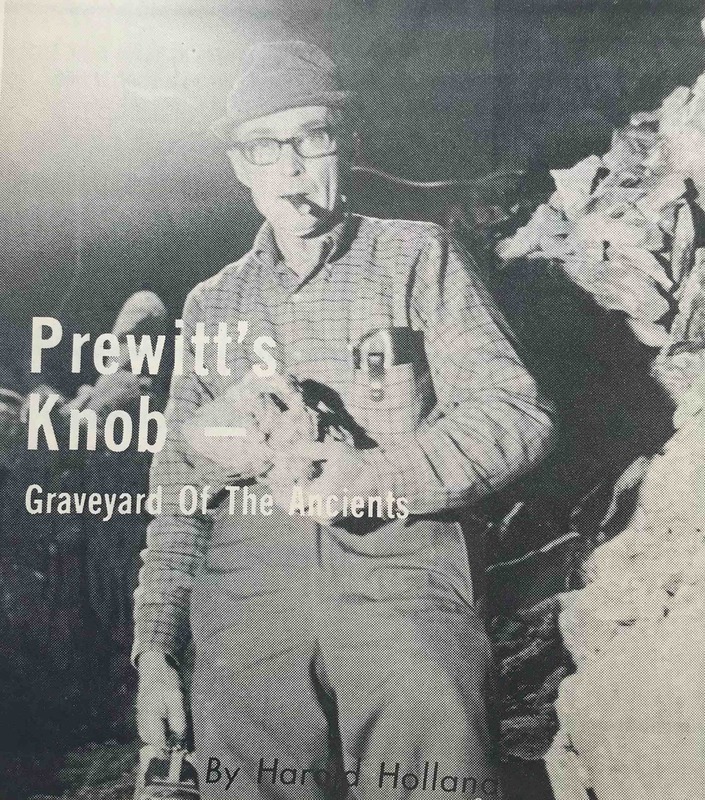 Those are among the fascinating features of Cleon Turner’s Crystal Onyx Cave on Prewitt’s Knob. The more discoveries Turner discovers, the more he believes there is to discover, and when his subterranean surveying will end is unpredictable. For the past ten years, since the day he dug into a sinkhole high on the Knob an found his cavern, Turner has continued his explorations, in addition to the work of installing stairways, and paths to make the labyrinthian cave into a tourist attractions. Soon after its discovery, Turner found in a lower level a quantity of semi-fossilized human skeletal remains, examined by UK experts and diagnosed as of a pre-Indian race, and some thousands of years old. 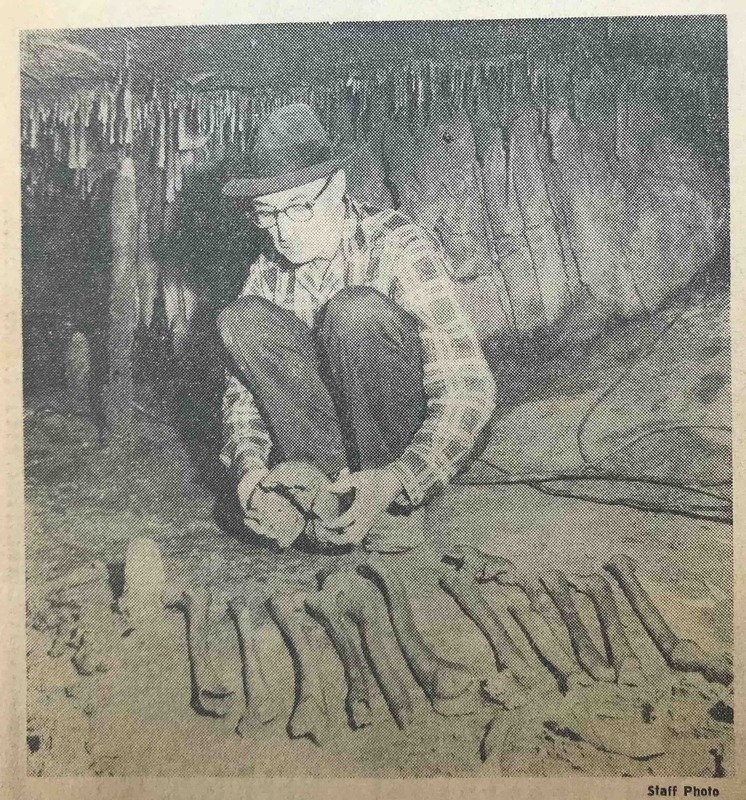 Now buried in gravel and stone, on the third level of the caves, Turner has come across another trove of human remains, apparently a sizable cemetery, containing numerous arm and leg bones, skull fragments, human jawbones, etc., intermingled with remains of bead necklaces and artifacts such as arrow points and stone clubs or axes. Turner’s entry route, and the present tourist paths, enter from the very top level, but the pre-historic visitors apparently entered by a totally different route. From the area where graves are now being excavated, a tunnel had almost horizontally, presumably reaching the outer world through some now unknown cave. But, before leaving forever, the ancient visitors seemingly carefully concealed this entrance, plugging the tunnel with rock. A short section, where it enters the big room on the lower level has been cleared by Turner and his helpers. An oddity of the section where the new gravesite are being excavated is that about thirds of it is a “wet cave” with one side where the Indian entrance was located water dripping steadily from the fantastic sculpture of stalactites overhead onto the almost level floor – but at one side, where the Indian entrance was located, and most of the graves, the room is dry, with ho water drip. At this side of the room, across from the ancient entrance, is another closed tunnel, which Turner believes leads into another large dry cave, the place where he is convinced the pre-historic people actually lived. 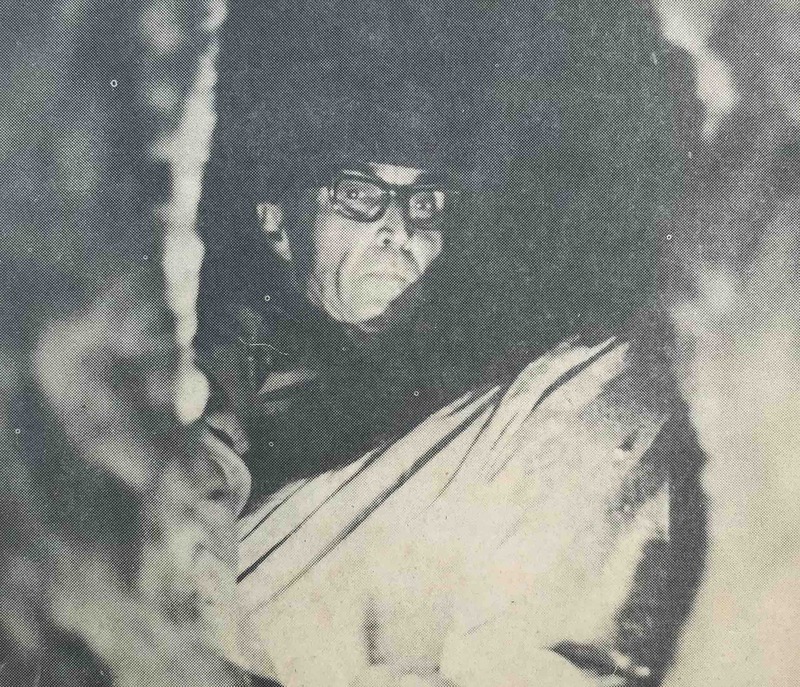 He is attempting to dig and dynamite a way into this area, and says the results of dynamiting attempts assures him there is another large space beyond, since as recent dynamite shot resulted in all the smoke, fumes and even concussion of the shot passing through come crevices into another as yet unknown and unvisited part of the cave, with no fumes drifting back to escape via the old part. The as yet unentered portion may be great, even much greater, than that now visited he thinks. A large glass-topped box in the big lower-level room contains part of the earlier find of human bones, plus what appears to be a buffalo jawbone. This lot includes a human skull. But more recent finds include an amazing quantity of what Turner says are human bones, and which have the appearance to a layman. 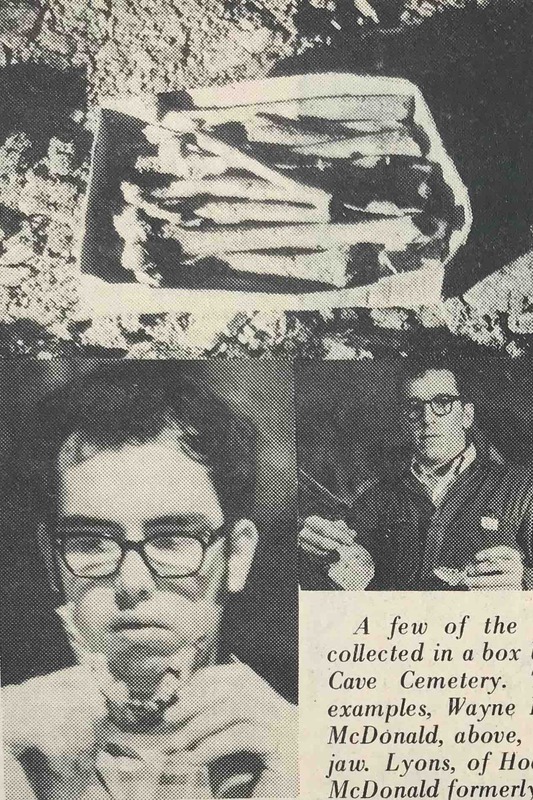 They were found in conjunction with quantities of charcoal, and Turner thinks the old people first burned their dead, then placing the bone in small graves covered with stones. Judging by the varying types of artifacts, and the rock strata in which he finds them, Turner believes two different races occupied the cave at different times, the first perhaps as much as five thousand years ago. Why they left, after filling in their entrance tunnel, is a riddle, though Turner has three theories he considers possible explanations. At present, nearly three-fourths a mile of the cave’s various levels and passages are open for tourist exploration, with guides. Steel or concrete stairs have been installed in most sections, with the original wooden bridge over a deep water-filled pit now being replaced by steel, on the “new discovery” route. At its deepest point, near the most recent bone finding, the explored area reaches about 200 feet beneath the surface, but Turner is convinced other and perhaps even larger and more spectacular levels will be discovered when he succeeds in forcing his way through the passage beyond the graveyard zone. Some of the now-opened passages of the cave have domed roofs 15 feet or more high; in other places the ceiling is less than six feet up, but everywhere there is a profusion of weirdly beautiful crystalline formations. 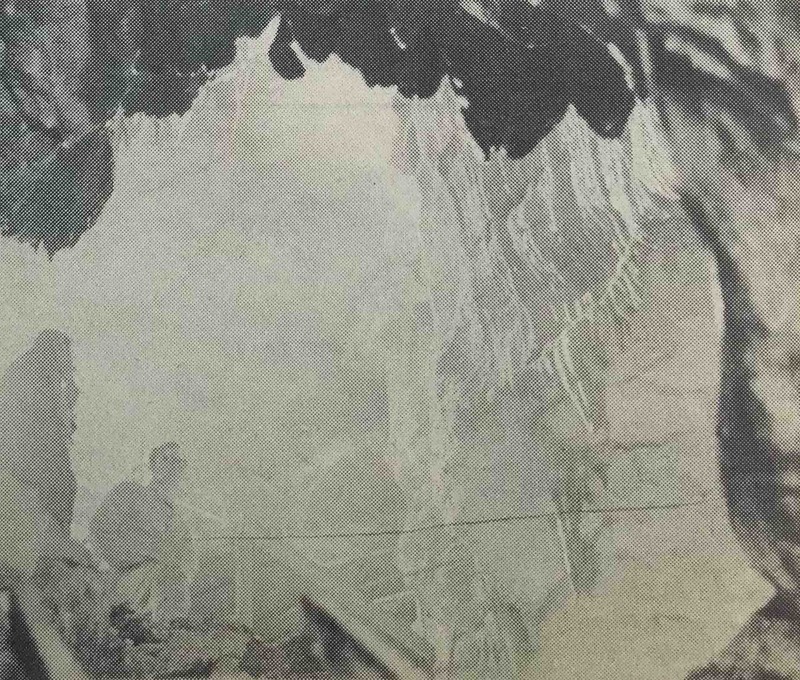 Turner expresses his conviction that, unlike other area caves, this cavern at some time in the very remote past, was affected by volcanic activity. He states that all the other caves he knows of hereabouts are the result of water working on limestone and sandstone, as this one largely is, but says there is evidence of some volcanic effect in primordial eras. In some of this theory, he displays a large fragment of what appears to be a crystallized stone, found at the burial sites. One thing is certain: As long as he believes there is any more to find, Turner will keep on searching for gateways to more worlds of underground wonders! Turner shows Daily Times sports editor Gid Pool one of two unusual beads found in the graves. The cylindrical objects have neatly drilled central holes, and are of yellow-white hue. The material is not positively identified but Turner believes they are composed of ivory. Other flat, disk-like beads are present in large numbers. A few of the many human skeletal remains are here collected in a box beside the excavations of the Crystal Onyx Cave Cemetery. Two Turner’s aides display typical examples. 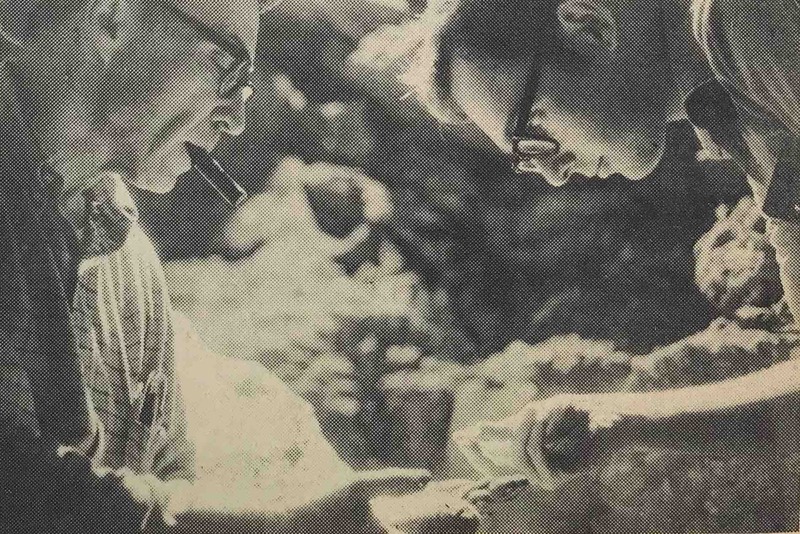 Wayne Lyons at right with a lower jawbone; Bill McDonald, above with the upper part of a skull, and another jaw. 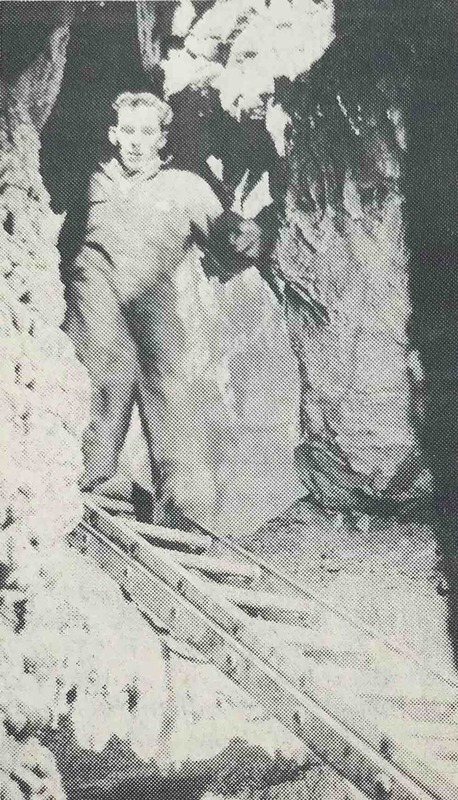 Lyons of Hodgensville, is a WKU geology student, and McDonald formerly was employed at Cape Kennedy, Fla.
Bill McDonald pushes into location a ladder leading to the lowest level: at center he descends the ladder to the site where a break-through is being attempted to another system of caves. 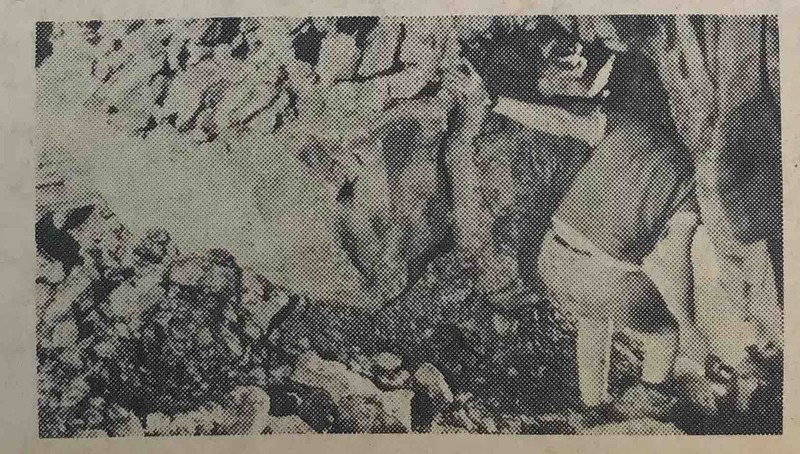 After the dynamite shot, Wayne Lyons checks to see if the explosive’s some is dissipating and to determine the direction air currents are carrying it. Again, the smoke flow was away from the known part of the cave. From this lowest point, looking back up, Munfordville attorney Bob Snyder, an investor in the Crystal Onyx development, and Reporter Pool wait in the grave-site room while dynamite charges are placed below. 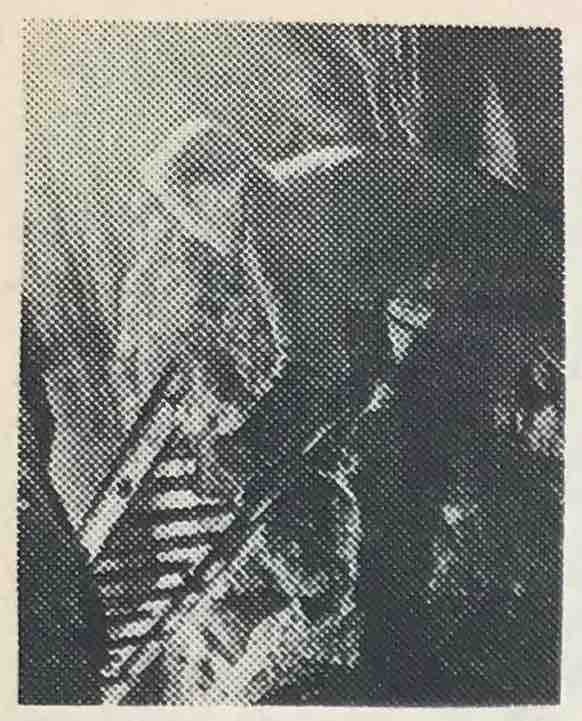 Bill McDonald descends the ladder to the site where a break-through is being attempted to another system of caves.